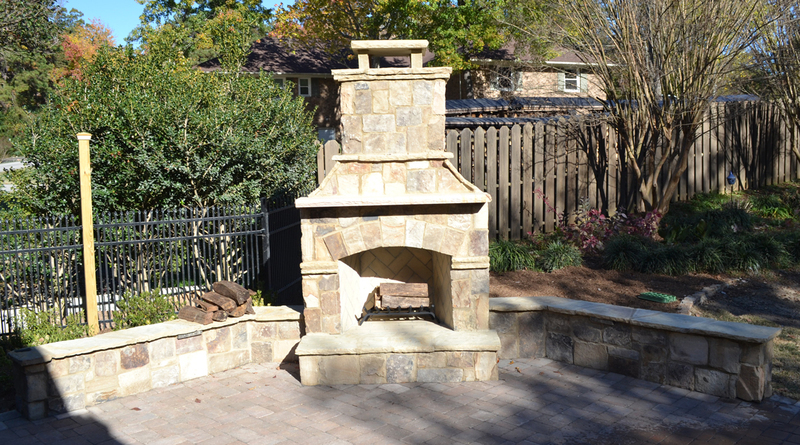 What does your dream outdoor living space include? A deck and porch? A patio and deck? A fire feature? 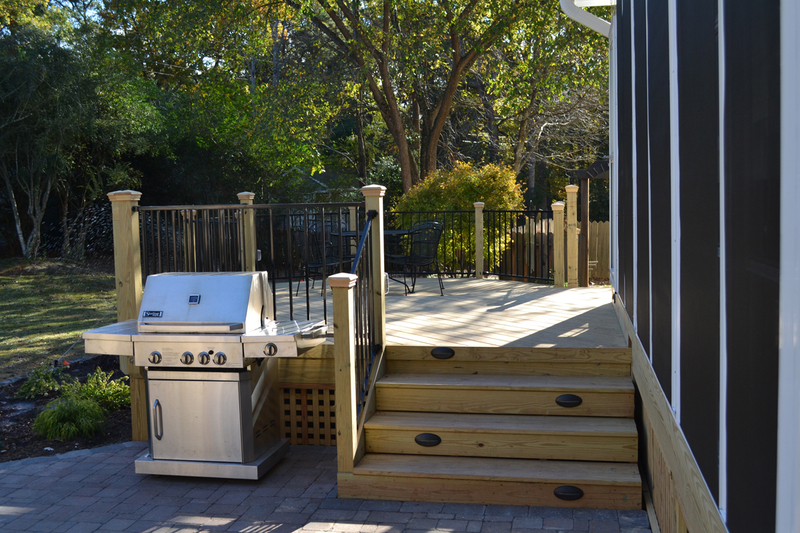 Let Archadeck of Raleigh-Durham build you a space that has it all. That’s what we did for this wonderful Durham family that wanted to be able to enjoy their backyard throughout the seasons, in any weather, in an attractive space. We designed and built a custom combination project that gave them exactly what they wanted, in the comfort of their own home. A focal point of this combination project is the Eze-Breeze 3-season room that serves as a great two-for-one space. 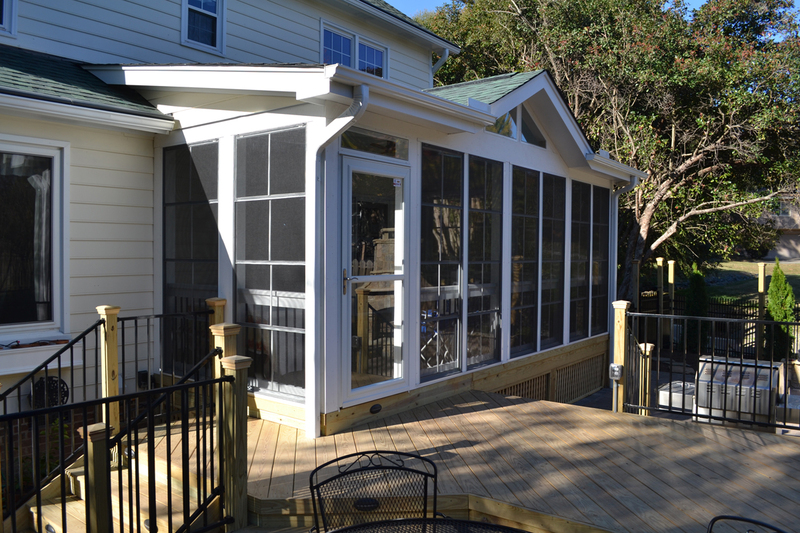 The family can use the screens on lovely summer days to let warm breezes in and keep pesky insects out. In cooler temperatures or on rainy days, a quick close of the windows keeps unwanted weather outside. 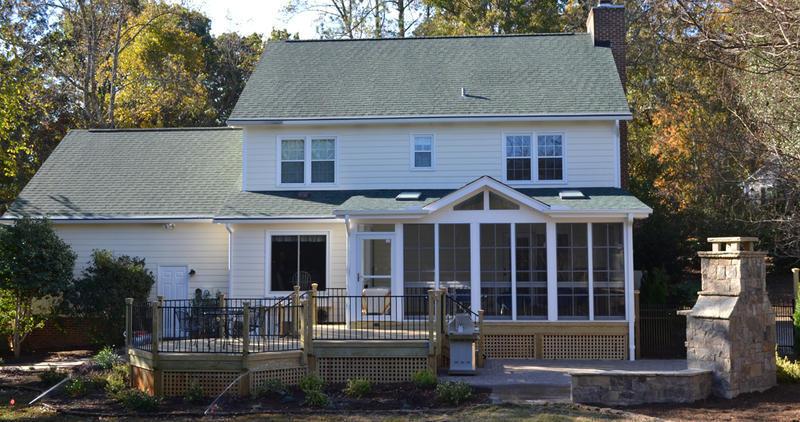 To accommodate the homeowner’s tall height, we lowered the deck floor so the roof would be higher, yet still fit below the second story windows. We also designed the roof of the 3-season room with an open gable in the center for further loftiness. One of the design features our clients wanted was a Carolina blue ceiling, in the classic southern tradition. 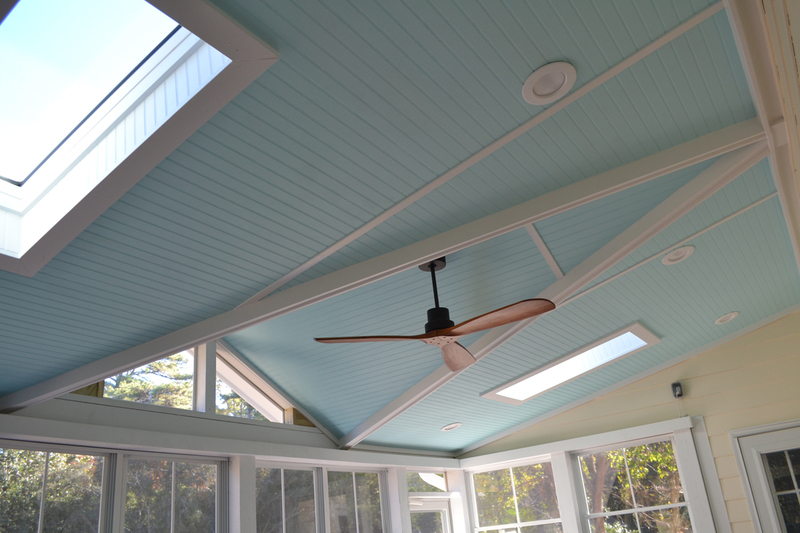 Blue porch ceilings give the space a bright and open feeling while mimicking the blue sky. We added skylights to the roof to add to the sense of airiness and increase the daylight that streams into the space. This is a wonderful place to spend time dining, reading, and relaxing with friends and family. Outside of the porch, a two-level deck provides additional outdoor living space and serves as a natural transition to the yard. Guests can step down one level to enjoy the outdoor dining area on the deck or head all the way to the patio. 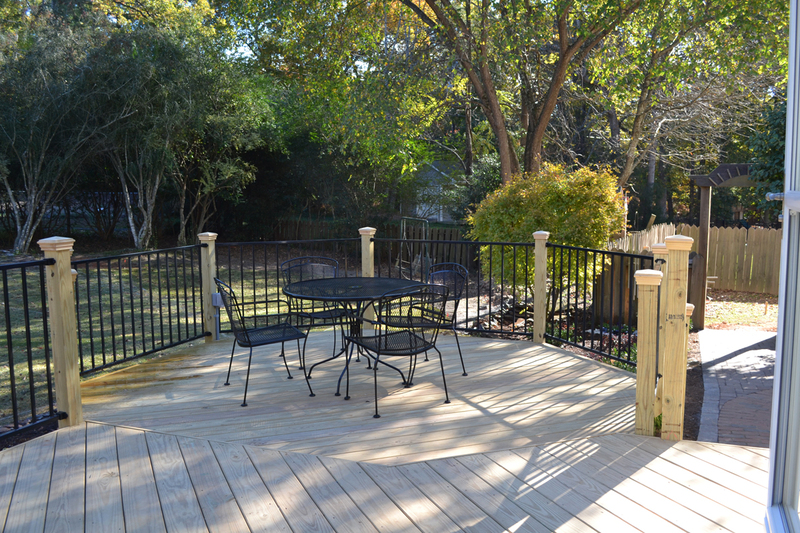 The deck offers a perfect space to relax in the sun while watching kids play in the yard. The black Fortress rails minimize obstruction of the view from the deck to the yard and patio and require little maintenance, for ease of use. A patio and fireplace combination area sits below the deck and 3-season room, providing an adjacent but separate space that allows for easy entertaining with large groups. The built-in wall creates seating that never has to be stored or protected from the weather. We also added deck lighting to the stair risers to allow for safe navigation from the patio to the deck and 3-season room when entertaining in the evening. Some of the finishing touches that separate this project from others are subtle; yet add up to create a truly polished product. Lattice underpinning, Fortress Iron Railings, decorative post caps, and a unique but functional deck design all work together to give this homeowner a fully customized and elegant space. 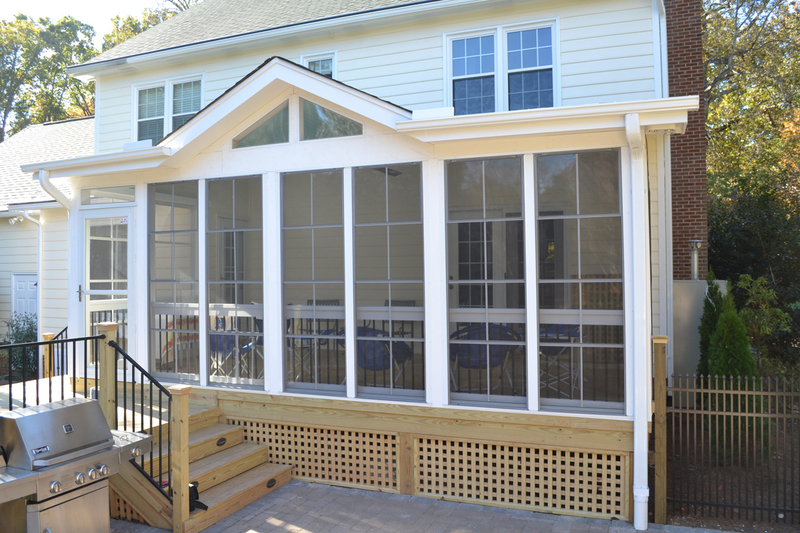 If you’re dreaming of a deluxe outdoor living space that incorporates all of your favorite outdoor living features, call Archadeck of Raleigh, Durham and the Greater Triangle today: 919-973-1523. We look forward to working with you!